HONOLULU — The Hawaii State Department of Labor & Industrial Relations (DLIR) today announced that the seasonally adjusted unemployment rate for May was 2.7 percent, the same as in March and April. 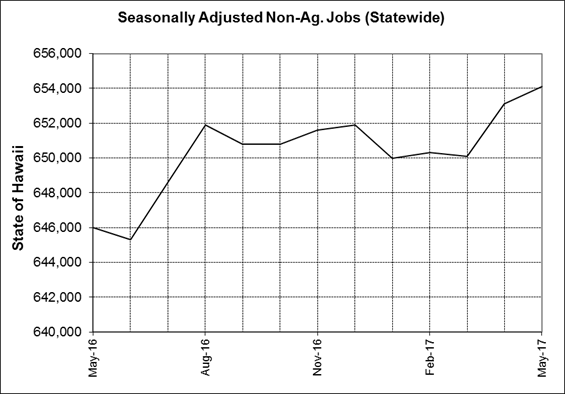 Statewide, 678,300 were employed and 19,150 unemployed in May for a total seasonally adjusted labor force of 697,450. “Hawaii’s economy is holding firm at a low 2.7 percent unemployment rate for a third consecutive month,” said Linda Chu Takayama, director of the state Department of Labor and Industrial Relations. Nationally, the seasonally adjusted unemployment rate was 4.3 percent in May, compared to 4.4 percent in April. Both initial claims and weeks claims increased by 11 or 0.9 percent and by 781 or 11.2 percent respectively for unemployment benefits compared to one year ago. 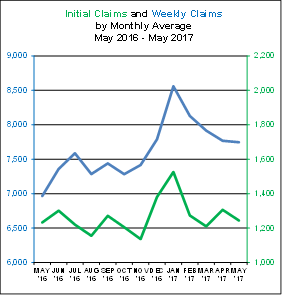 Over-the-month both initial claims and weeks claims decreased by -4.7 percent and -2.0 percent respectively in May 2017. 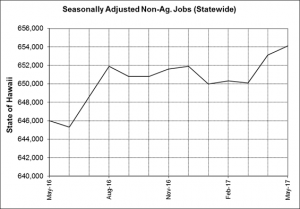 The not seasonally adjusted rate for the State was 2.7 percent in May, compared to 2.6 percent in April. In another measure of employment, total nonagricultural jobs increased by 1,000 over-the-month. 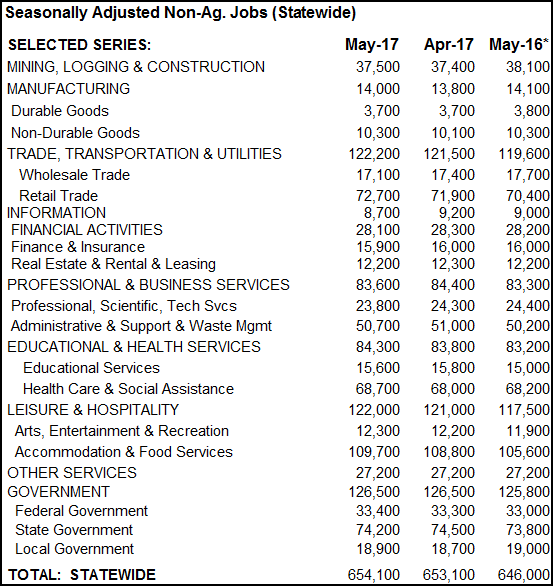 Among the major industry groupings, there were job gains in Leisure & Hospitality (+1,000), Trade, Transportation, & Utilities (+700), Educational & Health Services (+500), Manufacturing (+200), and Construction (+100). Job expansion in Leisure & Hospitality was evenly split between Accommodation and Food Services & Drinking Places. Within Trade, Transportation, & Utilities, the bulk of the increase was in Retail Trade. There was no change in employment in Other Services. Job losses occurred in Financial Activities (-200), Information (-500), and Professional & Business Services (-800). Within Professional & Business Services, job losses were concentrated in Professional, Scientific, & Technical Services and in Administrative & Support & Waste Management & Remediation Services. Jobs in Government remained stable. Compared with May 2016, total nonfarm employment has risen by 8,100 jobs. Statewide and substate data for 2012-2016 have been re-estimated to reflect revised population controls, model reestimation and for seasonally adjusted data, new seasonal adjustment. This release incorporates revised job count figures from 1990 through 2016 for the seasonally adjusted series. The reconstructed data reflects data from historical corrections applied to unadjusted supersector or sector level series. 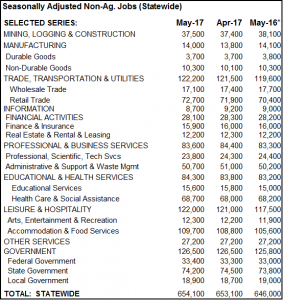 For years, analysts with the State DLIR’s Research and Statistics Office have developed monthly employment estimates for Hawaii and our metropolitan areas. 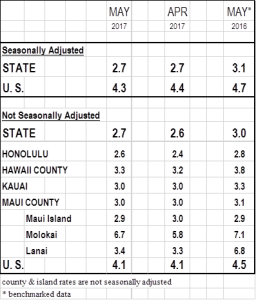 These estimates were based on a monthly survey of Hawaii businesses and analysts’ knowledge about our local economies. Beginning with the production of preliminary estimates for March 2011, responsibility for the production of State and metropolitan area (MSA) estimates was transitioned from individual state agencies to the U.S Bureau of Labor Statistics (BLS). BLS publishes smoothed seasonally adjusted civilian labor force and unemployment estimates for all metropolitan areas, which includes the City and County of Honolulu and Maui County. BLS releases this data each month in the Metropolitan Area Employment and Unemployment news release. The schedule is available at http://www.bls.gov/news.release/metro.toc.htm. 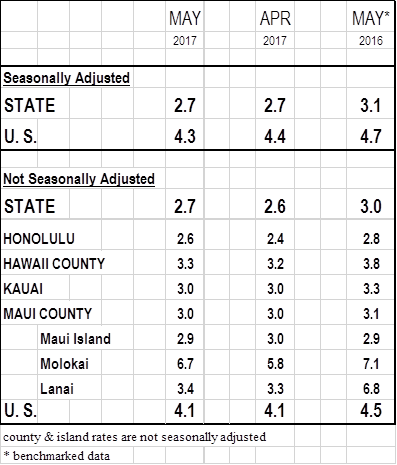 Alternative Measures of Labor Underutilization for States, Second Quarter of 2016 through First Quarter of 2017 Averages.